For most of my life, I have been a night owl. Working the nightshift was like staying up late, and I loved it. But then, when I'd have a few days off, I began to find myself waking early. It wasn't long before I learned to love the early morning hours. When I took a year off from work after my Mother died, for the first time in my life, I became a morning person, rising with the sun, going to bed early and found that the early morning hours were so incredibly productive. 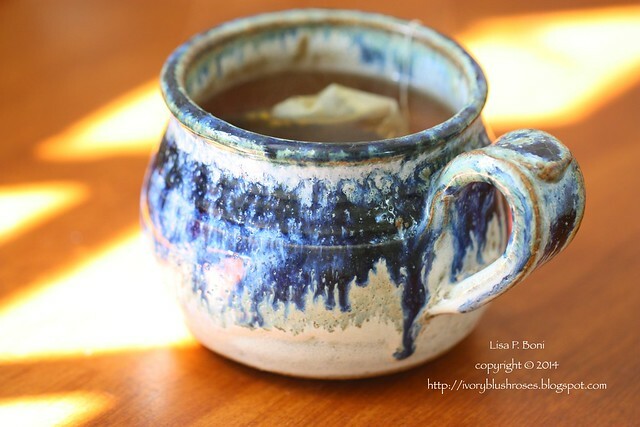 Those early morning hours, spent with a cup of tea, became my very favorite time of day. Then I had to go back to work... and the only job I could find in my field, was another night shift position. Despite having been at this job now for a year and a half, with little hope of a day position, I find I still crave that early morning time. There aren't many days where I really get to enjoy early mornings, unless I have a number of days off in a row, which lately hasn't happened very often. Usually, I head to work around 5:15 p.m., arriving at work just before my shift starts around 7:00 p.m. The shift doesn't end until I've given report to the oncoming shift ~ and it's not at all unusual that I don't get to head for home until 8 or 8:30 a.m. with an hour and a half drive in front of me. I usually fall into bed around 9:30 to 10:00 a.m. and wake (ideally) around 4:00 p.m. That leaves just enough time to shower, grab something to eat and head out the door. On my first day off, it's not unusual to sleep the entire day, wake for just a couple of hours and head to bed again. If I have just two days off, which seems to be the case lately, then I've lost one of them entirely to sleep and the second one is spent doing regular household chores and preparing for the next round of work. How glad I am that this week, I have four days off! It has meant that at long last, I've finally had a chance to sit and stitch and begin the process of trying to catch up on Round Robins that I'm woefully behind on. It also means that I've had a couple of mornings in which to enjoy that early morning cup of tea that I enjoy so very much! 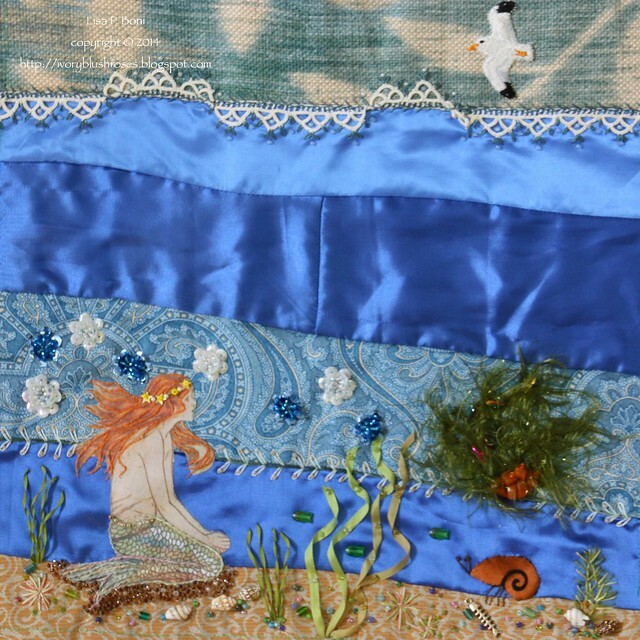 In stitching, my first order of business is to catch up and finish the Under the Sea round robin that I am in. My block has already returned to me, but I am months behind on getting two blocks finished and mailed. 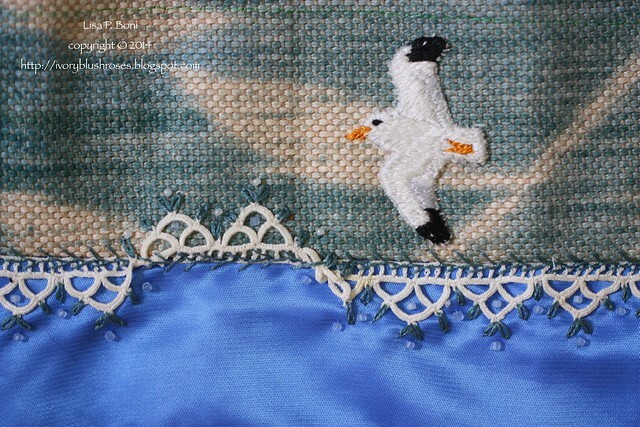 For Shelly's block, I embroidered a sea gull and added a lacy bit of froth to the horizon line. I also added some embellishment to the mermaid ~ enhancing both her hair and tail. Now the block is off to Ola to put her finishing touches on it before it heads home to Shelly. In the Hearts Round Robin, I'm also somewhat behind, but wanted to get Alexandra's block finished and mailed to Renee so it doesn't get too far behind. Alexandra asked for primarily embroidery, so I followed suit to what the two stitchers prior to me did and just used thread for the seam work and motifs. 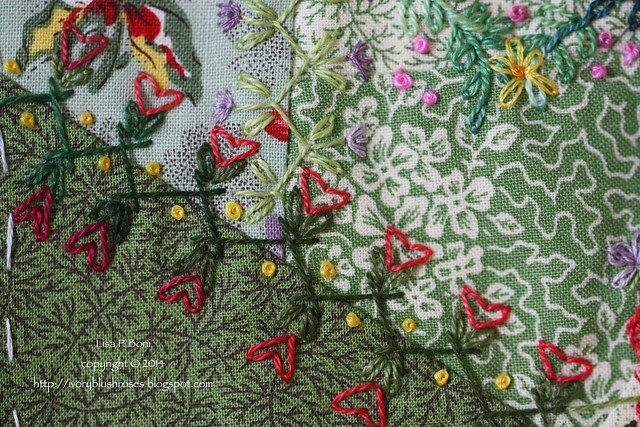 Since it's a Hearts round robin and the block doesn't have any hearts on it to start with, I added some in the seams I did. I really love this seam! It is one I modified from one I saw in someone else's work ~ I wish I could remember who it was now! 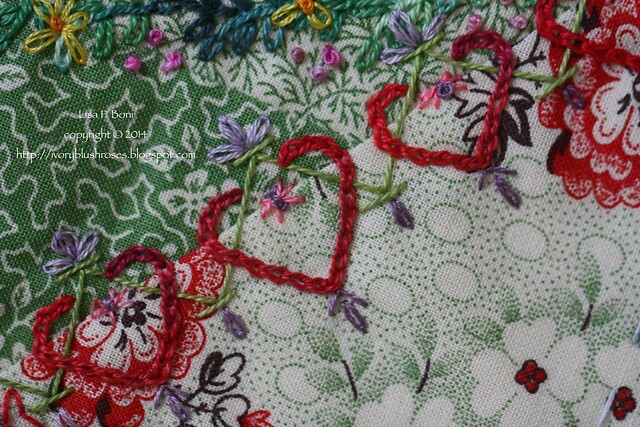 Since the other two blocks had lovely embroidered heart wreaths on them, I added one too. But I miscalculated the colors and it really blends into the background. It doesn't show up nearly as much as I would have liked it to. Here you can see all the blocks together. As you can see, the blocks were quite large to begin with, so I marked out a six inch square that I embellished as did one of the other stitchers. Looking forward to seeing what the other ladies will do with the remaining blocks! Next up, I have Ola's Under the Sea block to finish, a Hearts DYBlock for Barbara, and a Fan Block for Thearica. Hoping to have all three done before I go back to work on Sunday night! When I get another few days off, I still have blocks to do for Connie and Tahlia. Not to mention that I'm behind on the CQJP 2014 pincushions! With all of this to do, I'd better get back to stitching! But I can't leave without sharing a few photos from my garden! Earlier in the week, I arrived home surprisingly early from work, which gave me a few precious minutes in the garden before I headed to bed. 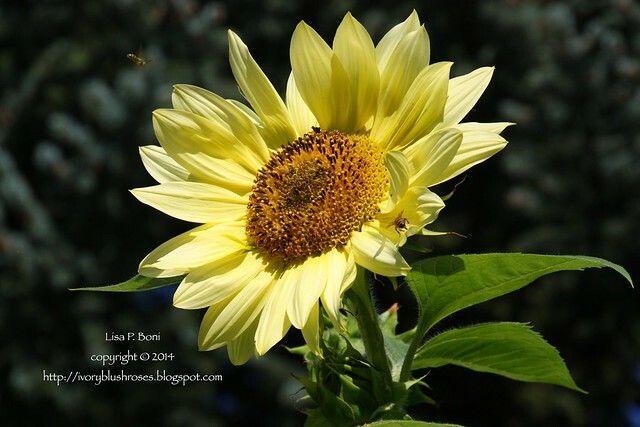 The bees were loving the sunflowers! Though they were all supposed to be this vanilla color, most of them ended up being the bright yellow ones, but it was this pale one that attracted all the bees! 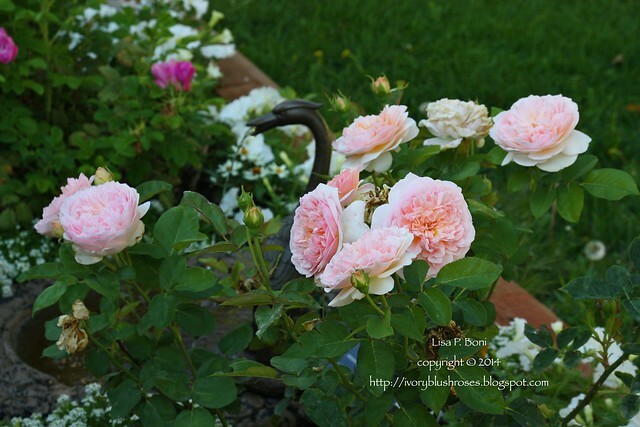 The roses are blooming with wild abandon! So gorgeous! 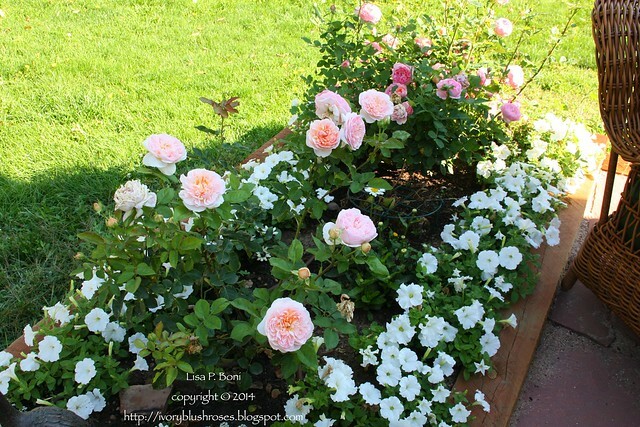 I'm loving the darker pink Boscobel roses on the end and the wonderfully fragrant Evelyn in front of it! Oh my gosh Lisa, your work schedule would be too much for me. Bless your heart. I'm glad you're having a 4 day break and able to get some lovely stitching in too. 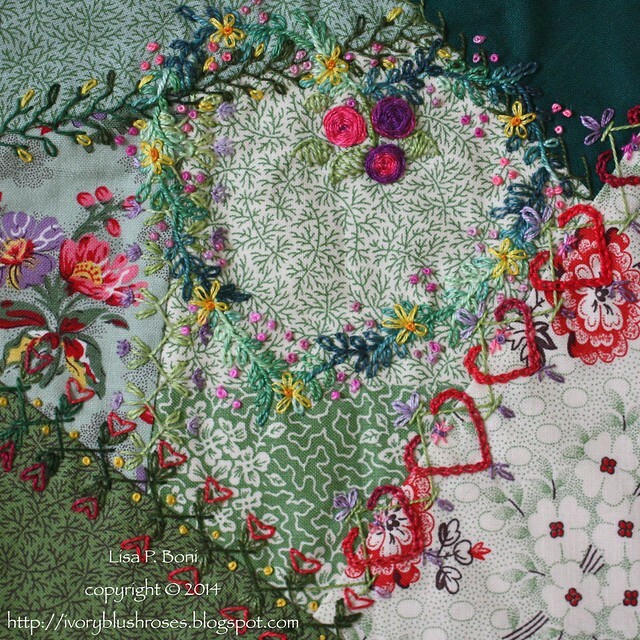 I get excited and inspired when I see what you are up to with your stitching. Wow your work schedule is really tough! Love the seagull and the wave in ingenious! Wow, Lisa! Your schedule is amazingly busy. Your work is absolutely stunning. I am so lucky to be able to see some of it in person. Your seagull absolutely blew me away. How fabulous! 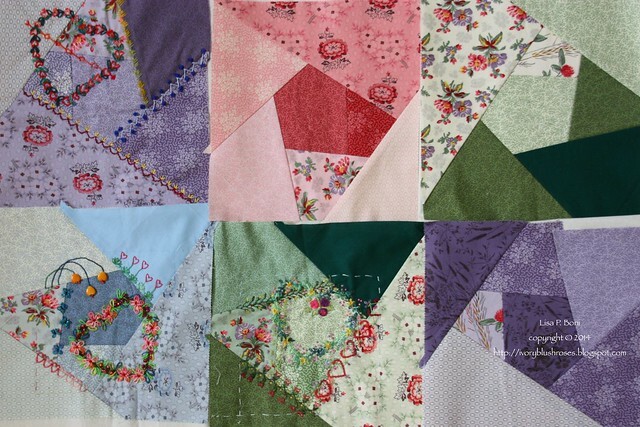 And your work on Alexandra's block is lovely! 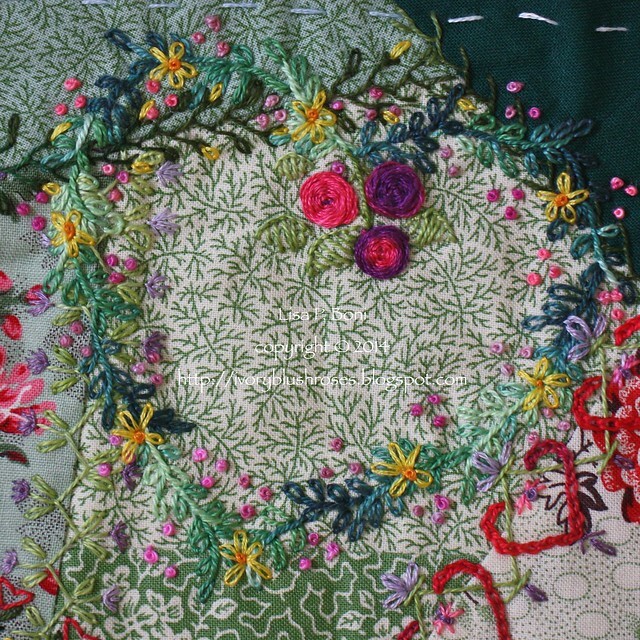 With all of that stitching, I hope you are finding your 4 days off relaxing. Wow. Such a schedule! Glad you can find time to create. You do such beautiful work. Enjoy the break.